HG Logistics News Can Captain America Save Us From Our Mistakes? Can Captain America Save Us From Our Mistakes? One of my responsibilities here at HG Logistics LLC, a transportation freight broker and third party logistics company servicing the United States, Mexico, and Canada, is to write a weekly blog. Some weeks I have difficulty coming up with a topic or at least a topic I feel comfortable writing about. However, this week I had no problem thanks to a five year old little boy named Conner. A few weeks ago when I came home from work, there was a picture someone had colored hanging on my refrigerator door. I have not had my refrigerator decorated with such art work in quite some years considering that my children are now in their twenties. Nevertheless, this was a welcomed surprise. It brought back fond memories of when I so proudly displayed my own children's art. After reminiscing for a few moments, my mind then shifted to trying to determine who put it there. First, I concluded that it was probably a little boy because the picture was of Captain America, which seemed like a boy thing to me. I know I should not stereotype, but I wanted to narrow down the possibilities in order to solve the mystery. I started by asking my daughters if they knew how the picture got there, thinking maybe one of the little boys in the neighborhood colored it for them. Neither one of them knew anything about the picture. I then asked my husband, and as I expected, he was totally clueless about the situation. Since my son works at night, I rarely see him, so it took another four or fives day before I had the opportunity to ask him. He, however, had the answer. He said that Conner, my daughters friend's little boy, colored it and gave it to him. Aha! Finally the mystery was solved. This past weekend Conner was at my house, and I asked him if he colored that beautiful picture hanging on my refrigerator. He gave me a blank look as if he did not know what I was talking about. I told him to go look at it and see if he remembers doing it. He went over to my refrigerator and studied the picture. 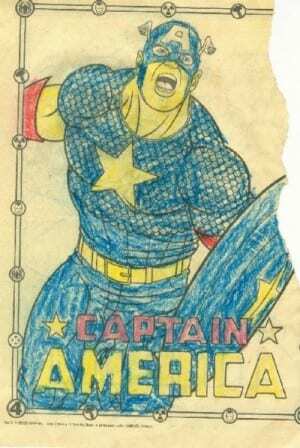 He first commented that Captain America's shield is supposed to be white and red, not blue and yellow. He studied it a bit longer and then shook his head and said, “No, I did not color this picture because it has mistakes in it, and I don't make mistakes.” It took every bit of effort for me to hold back my laughter because I could tell he was serious. Then I began to think how nice the world would be if we were all like Conner and never made mistakes, but reality says that is not going to happen. The only place that can happen is in a five year old little boy's mind who still believes life can be perfect. Even at HG Logistics, we wish everything would be perfect. We strive to make HG Logistics' workplace mistake free. We have set policies and procedures in place to minimize and even eliminate errors. HG Logistics does not want to disappoint. Believe me; we want to avoid all mistakes if humanly possible. The problem is that we are human and humans do err. The truth of the matter is that none of us are perfect and some day Conner will realize he too is not perfect. All we can hope for when we do err is a little understanding, forgiveness, and a second chance. Here at HG Logistics we are always learning, thus always succeeding.